Clients must arrive and depart on same flight. 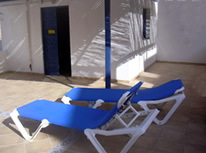 Corralejo is an established coastal town/resort located only a short drive from airport in the North of Fuerteventura. Although a popular tourist resort it still retains some of it’s original charm/character and the beaches/dunes on the edge of town rival some of Europes finest. 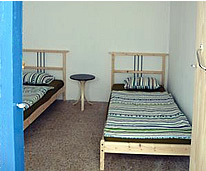 All guests stay in our sociable Hostel for Boardriders located in the popular harbour/marina area. Our Windsurf Camp is great value for money and ideal for single travellers and young friends who want to learn how to kitesurf, meet other people and enjoy the laid back Canarian nightlife! Flag Beach and the lagoons located on the outskirts of Corralejo are a fantastic windsurf location offering flat waters and consistent winds in summer and waveriding conditions in winter. The warm climate, consistent wind and variety of conditions make it a great all year round windsurf destination. The trade winds blow from as early as March through to Sept, summer is the prime season however there is sufficient wind for courses to run all year. The aim of Learn to Windsurf program is to give people a safe and fun introduction to windsurfing and by the end of the course you will have learned the fundamentals of windsurfing (See course outline below). *Single traveller staying in a private bedroom. If you are a young couple or a group of friends who would like to stay in a private bedroom then please contact us for a tailormade quotation. Please note: all prices are per person and places are subject to availability at time of booking. We accept payment in Euros (€ EUR). NOTE: Flights are not included in price, check out our Getting There guide for low cost flights to Fuerteventura Airport. 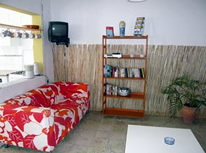 This popular boardriders hostel and base for the windsurf camp is located in the centre of the resort close to the harbour/marina area of Corralejo within easy walking distance of surf, local amenities, the main town beaches and nightlife. 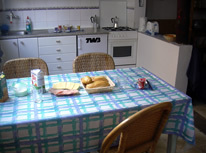 The accommodation is popular with single travellers, young people and travelling windsurfers which creates a great vibe and atmosphere. The traditional Canarian town house is split over 2 floors, it has 2 fully equipped kitchens, a spacious lounge/living area and a total of 7 bedrooms (singles, doubles and triples). There is a large roof terrace providing plenty of outdoor space to chillout and organise a BBQ. The local team will help make your stay as comfortable and enjoyable as possible. FACILITIES: TV | Bathrooms/Shower | Hob | Fridge | Coffee maker | Roof terrace with BBQ’s | Board storage facilities | Free WIFI available. 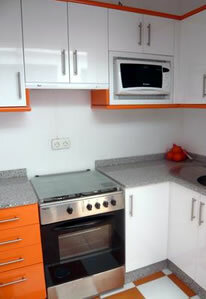 FACILITIES/SERVICES: The house is cleaned on a daily basis and bed linen and towels are changed on a weekly basis. BREAKFAST: A continental breakfast is served daily between 09:00-10:30. The Windsurf School was opened in 1987 and since then it has established itself as one of the most respected Windsurf and watersports centres in the north. The coaching program has been developed according to the VDWS (German Windsurfing Organization) guidelines and the aim is for students to become safe, responsible and self-sufficient windsurfers. The Windsurf Instructors are qualified via the VDWS scheme and all have the necessary skills and patience to help you progress in a safe but fun enviroment at your own pace. For safety reasons and to ensure you get the attention you need on dry land and in the water, the windsurf Lessons have a low student to instructor ratio. All students are placed with an instructor who specialize in teaching at a particular level. All beginner and intermediate courses are run in large shallow tidal lagoons a short drive away from the resort . All the equipment used by the Windsurf School is provided by leading windsurf brand FANATIC and the equipment used for the courses is specifically designed for beginners and intermediates with ease of use, progression and safety being the key factors. The beginner windsurf course covers: Starting, 180 degree turn, steering, fast tacking, harness, launching and landing technique.